But what really makes me intrigued by this book is the description. It sounds like Jodi Meadows has created a fantastic new mythology, and I can't wait to learn about it. It also sounds like this book is going to have lots of adventure and romance -- both things I love. Great pick Michelle, I love the cover!! This book has an interesting concept, I'm curious to see how it plays out. This was my WoW a couple of weeks ago. :D I can't wait to read it too!! Great choice! This is definitely a book I'm looking forward to as well! I've seen this cover last week. The story sounds very good. Great pick for this week's Waiting on Wednesday. Thank you for sharing! I'm glad I've stopped by today! I'm dying to read this one and I'm incredibly jealous of everyone who already got the chance to do so. It just looks and sounds amazing! Incarnate sounds really cool I love the cover! Great pick, Michelle! Such a beautiful cover! And it sounds like what's inside might live up to the outside, which is always good ;) Great pick! That's a great choice, Michelle. Incarnate sounds very good & that's a gorgeous cover. Thanks for sharing! 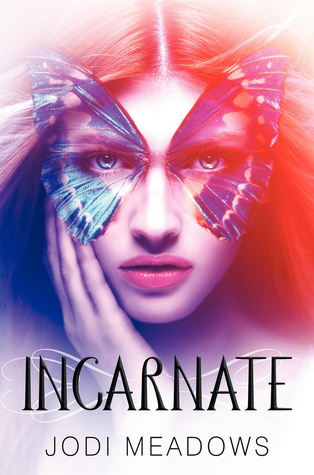 I agree that Incarnate has one of the most beautiful covers I've seen in a long time. And the synopsis is just as intriguing! Great choice! Ack, I got a copy of this way back in August, but I just haven't had time to read it yet even though I'm so excited for it! :( But I'm really interested in it, and see what sort of mythology is in it (as you mentioned, Michelle)! Great choice. :) Got a copy of this not to long ago, and I am really excited to read it. YES, YES, YES. I did a cover review for this awhile back because I could NOT STOP gushing about it. The butterfly mask, the breath-stealing covers, geez, I want my hands on this book so, so bad. And yes, the reincarnation aspect KILLS. I can't wait to see where she takes it! I am really excited for this one. I love the concept of reincarnation, so this book sounds right up my alley! This book sounds really mysterious! I'm loving the masks too. =) Great WoW! I've seen this one all over great pick!! Mine is up as well.